Alexandre is a Research Staff Member in the Natural Resources Solutions group at IBM Research – Brazil. He joined IBM in December 2012. Alexandre is also an adjunct professor at the Applied Mathematics School of Getulio Vargas Foundation (EMAp/FGV). Alexandre has taught many graduate and undergraduate courses: logic, data structures, programming, formal languages, and automata theory. 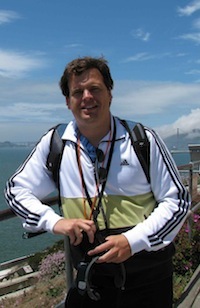 Alexandre holds a Ph.D. (2010) in Computer Science from Pontifical Catholic University of Rio de Janeiro (PUC-Rio) and M.Sc. (2005) in Computer Science from Fluminense Federal University, and B.Sc. (2001) in Computer Science from Federal University of Rio de Janeiro. During his Ph.D., Alexandre was an international fellow at Microsoft Research and SRI International. At MSR, in 2008, he worked with the Z3 SMT Solver team (Leonardo de Moura and Nikolaj Bjørner) developing a distributed environment for testing and optimizations of Z3. At SRI International, in 2009, he worked under the supervision of Natarajan Shankar in different research projects including the preliminary formalization of ALC deduction systems in PVS. Alexandre participated in several research projects like MIST (using natural language processing and description logics for Knowledge modeling), ANUBIS (database consistency check) and Ontology and Context (investigating the problem of ontology alignment). In his thesis, we proposed new deduction systems for description logics under the supervision of Edward Hermann Haeusler, published by Springer with the title A proof theory for Description Logics in 2012 as a book of the series Springer Briefs. Alexandre is the author/co-author of more than 70 papers published in peer-reviewed journals and international conferences. His areas of expertise and interesting are logic, proof theory, knowledge representation and reasoning, type theory, computational semantics, lexical resources and computational grammars. Alexandre is also a board member of the Global WordNet Association and the current coordinator of the CE-PLN.